Did you notice the laneways you passed this morning? Those grey strips of concrete used to store cars and garbage? If you missed these everyday Vancouver spaces, you aren’t alone. With a few notable exceptions, these are gaps to hurry past, not hang out in. Running along dozens of blocks from Downtown to Marine Drive, and from the Endowment Lands to Boundary Road (and beyond), laneways and alleys extend 680 kilometres in Vancouver alone and cover 4 km2, which at $800 per square foot would have a whopping value of more than $34 billion. Yet, they remain one of our most under-utilized public assets. Vancouver is beginning to see their significance however. 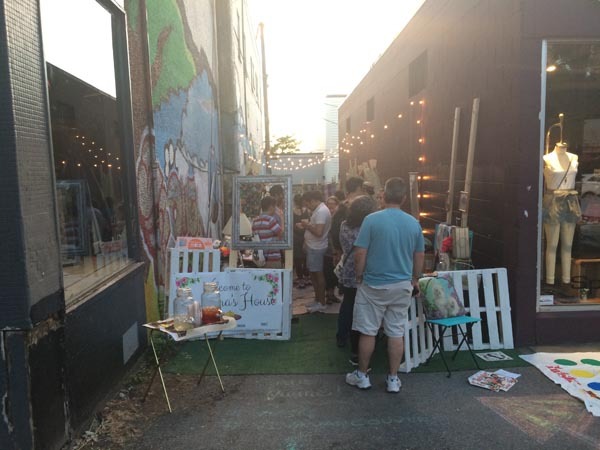 Projects like Alley Oop and Ackery’s Alley are bringing mundane laneways to life. But with price tags in the tens of thousands, and the need for teams of architects and designers, this approach is a challenge for communities across the city to replicate. The wellbeing, sociability and place attachment benefits of laneway transformations are well-documented. In an earlier experiment comparing Vancouver laneways, Happy City determined that people were 50% happier and 70% more trusting of strangers in Mole Hill, a lush green laneway, than in an adjacent hardscaped lane. Participants were also 110% more likely to pick up garbage and 70% more likely to be upset by vandalism at the green lane. Further, spaces covered in community fingerprints, such as DIY projects, signs of maintenance by neighbours or reflections of local culture, scored highly in terms of willingness to meet friends and likelihood to return. This was particularly evident in the laneways, where participants were 300% more likely to want to return to the green lane, compared with the neighbouring hardscaped lane. 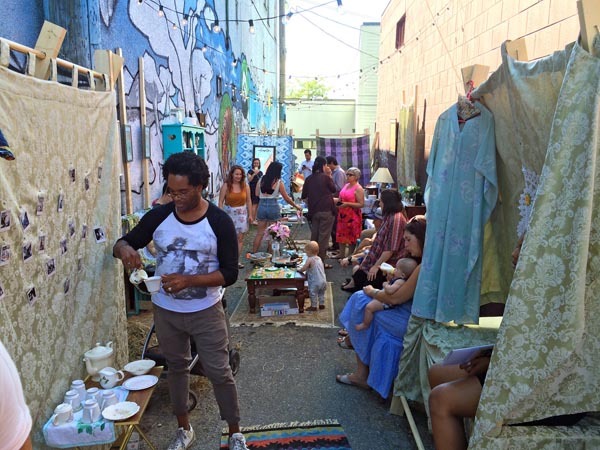 Seeking to harness the wellbeing, community building and placemaking potentials showcased in places like Alley Oop and Mole Hill, but without breaking the bank, the Vancouver Public Space Network undertook Laneway Living Rooms. With a grant from Viva Vancouver, VPSN used a “lighter, quicker, cheaper” approach, with an emphasis on wellbeing principles in urban design, to transform two laneways during summer 2017. 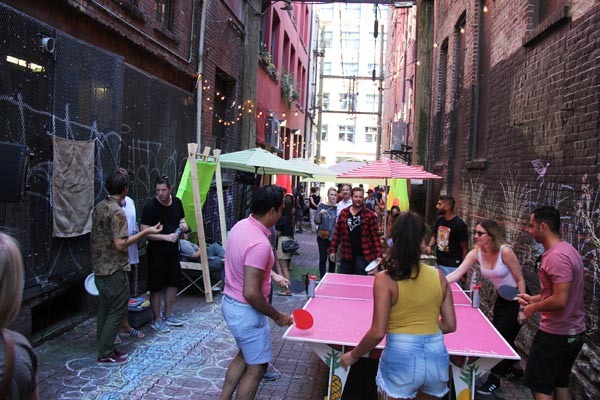 The intent of these tactical urbanism activations was to engage an array of volunteers, neighbours and local businesses to demonstrate the opportunities and benefits of rapidly transforming unloved laneways into people-friendly places at low cost. In doing so, the projects sought to showcase lanes and alleys as places for people, and encourage people to undertake their own laneway projects, strengthening the idea that streets and laneways are valuable public spaces. Understanding the value of streets, alleys and laneways as places for people is particularly important in densifying cities like Vancouver. With more people living closer together, often in smaller spaces, the public realm is becoming – and needs to become – an extension of our living room. 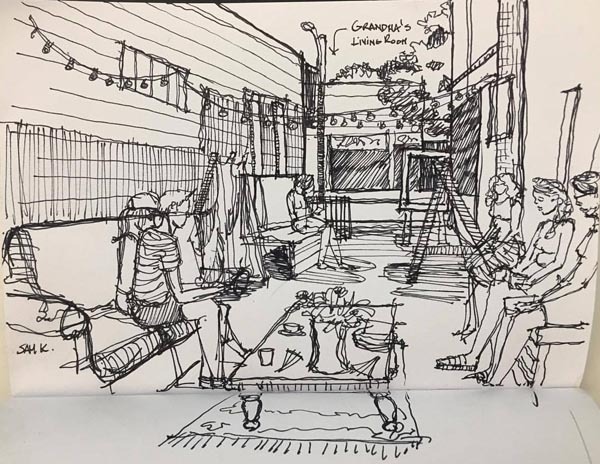 Playing with this notion, the Laneway Living Room project applied two traditionally private settings – the living room and the backyard – to a laneway and alley – spaces that are often viewed as threatening or unwelcoming. On Commercial Drive, a lane was transformed from “Vancouver’s favourite illegal parking lot” into cozy and colourful Grandma’s House. Pallet seating, and an array of couches, carpets and furniture from Miscellany Finds re-shaped this derelict passage into a pleasant area for neighbours and passers-by to connect. People drawn to the old-time aesthetic were able to visit Miscellany, next door, while others shared food from nearby shops and restaurants. As the sun set and music from a record player mixed with the voices of many visitors, it was clear that this space had potential for further design or regular programming. The Britannia renewal project could open the door for these activities. Grandma’s House, Photo: Mitchell Reardon. In Gastown, the concrete jungle was reimagined as the site of a Backyard BBQ. An iconic – but gritty – alley got a makeover, complete with a power wash, fresh white picket (pallet) fences, turf and greenery, music, games and more. As residents and visitors alike milled through the alley, playing ping pong, making chalk drawings or simply taking the scene in, a sense of connection among visitors – and to the built form – was palpable. Here, a series of dumpsters for neighbouring restaurants complicates a permanent transformation today; however, incorporating new waste solutions into the Water Street renewal, could open the door to new alleyway opportunities. 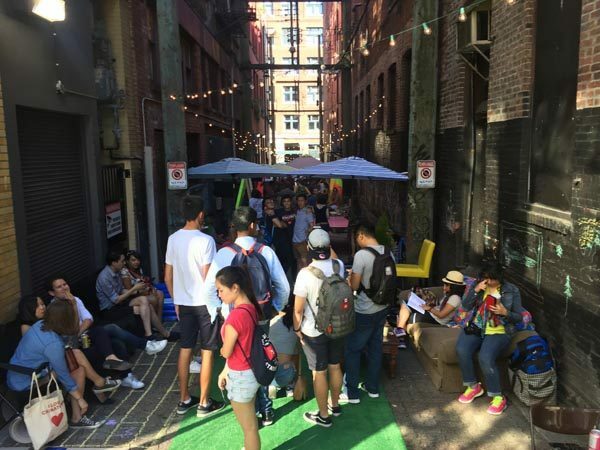 It was clear from the enthusiasm of local businesses and the hundreds of people who visited the one-day Laneway Living Room activations that there is pent up demand to transform our laneways into places for people. It was equally clear from these placemaking activities that community-driven tactical interventions can transform these spaces in cost-effective ways. And based on inspiring examples from around the world, it’s clear that this opportunity is not limited to Vancouver. In Vancouver and beyond, we can realize the placemaking potential of these overlooked spaces. With a little support from local government, residents can reimagine the public realm, and boost wellbeing, place attachment and happiness in their neighbourhoods. We all deserve more from our laneways. It’s time to sustain life between buildings. Thank you to Portia, Christopher and everyone at Miscellany Finds and Leanore Sali from the Gastown BIA for their hands on support at the sites. Shout out to all of the VPSN volunteers who worked morning to night on the sites and to Frida & Frank for providing the ping pong table. Thank you to Viva Vancouver for funding Laneway Living Rooms and The City of Vancouver’s Waste Management team for power washing the Gastown alley. Finally, thank you to Jens von Bergman for crunching the numbers on laneways and alleys in Vancouver.